Pediatric brains deserve special attention. Our team understands the unique needs of babies, kids and teens who are suffering from TBIs, seizures and brain tumors. We coordinate care across specialties to provide patients with a specific treatment path. We work with our Brain Injury Program to deliver coordinate care. Intracranial pressure (ICP) monitoring—This monitors pressure in the brain. Video electroencephalogram (vEEG) monitoring—A video EEG combines an EEG with video of the patient. The Children’s Pediatric Intensive Care Unit (PICU) has 24-hour coverage from a doctor trained to deal only with children and young adults. The neurocritical care team works closely with our Inpatient Rehabilitation Program to help patients recover. Physiatrists—doctors who are trained to deal with pain and rehabilitation—will design a program to fit each child’s needs. 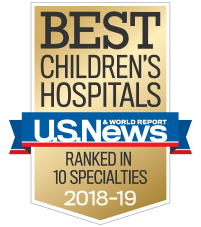 We have the only dedicated pediatric Level I and Level II trauma centers in the state—a special term given to a hospital because of its transport, emergency surgical, education and injury prevention services.